2 1/2d KGV Symbol of the Colony. 1d, 1 1/2d and 2 1/2d KGVI Coronation. 4c and 12c International Red Cross. 4c and 12c International Red Cross, QEII. 1c, 2c, 3c, 4c, 5c, 6c, 8c, 10c, 12c, 20c, 24c, 42c, 48c, 60c, $1.20, $2.40 and $4.80 Fruits and Vegetables of Montserrat QEII. 3c, 4c, 15c and 20c British Red Cross. 1c, 2c, 3c, 5c, 50c and $1 Universal Postal Union. 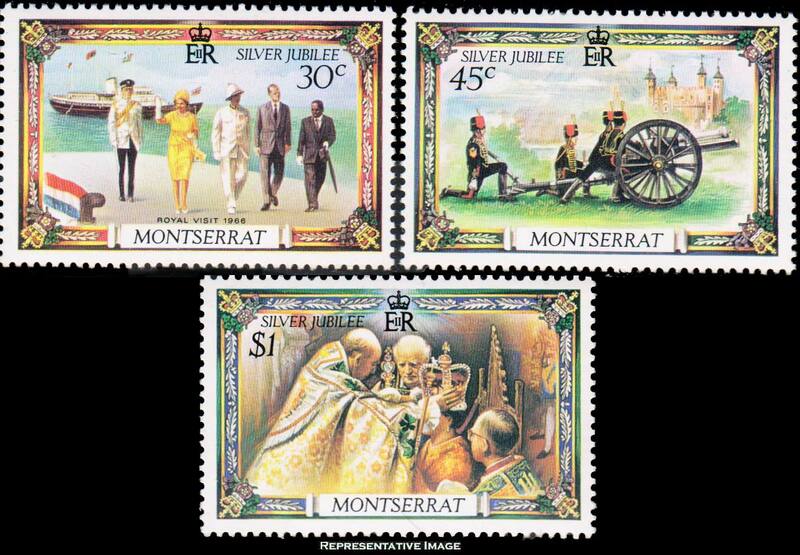 30c, 45c and $1 QEII Silver Jubilee.